Paperwork is a necessary evil of running an auto dealership. Whether it’s for the office, the sales department, the service department or just for parts it’s important to keep processes organized and efficient. 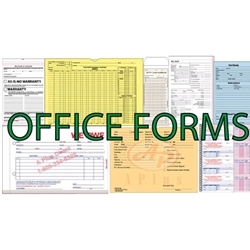 Having the proper forms and paperwork can help to greatly streamline many dealership functions. Utilizing the correct deal forms can also increase productivity, accountability and reduce mistakes. Not to mention, customers will expect your dealership to be using the proper forms. Many suppliers also offer some customization options for many forms, which is a great way to improve your brand. Even policy holders and document wallets can be customized to help create the perfect positioning experience for the customer. If you are unsatisfied with your current forms, or are looking for a less expensive alternative, online dealer suppliers may be a much more effective route. Reputable online dealer supply retailers can often offer products at a lower prices, as opposed to retailers who endure the costs of physical paper catalogs. You can visit My Dealer Supply’s entire form library at http://www.mydealersupply.com/s-8-forms-library.aspx. In conclusion, it’s important to make sure you are using the right forms for your business. Be sure to carefully determine which forms include the fields you require and may be right for you. If you have any questions about our forms, do not hesitate to contact our friendly and experienced customer service representatives.